This sounded so Scandinavian to me, but that’s because I live in a Norski kind of town. Skordalia is a Greek garlic-potato-nut mash that is so tasty and easy I have no idea why it isn’t made everywhere. It would be a great little addition to a Holiday party, or part of a hearty supper in the early darkness of these winter months. Naturally there are oodles of variations on this—some use dried bread instead of potato, some have nuts, some have eggs, some have vinegar—it seems garlic is the base and other items around the kitchen are added to make a delectable side dish or spread. 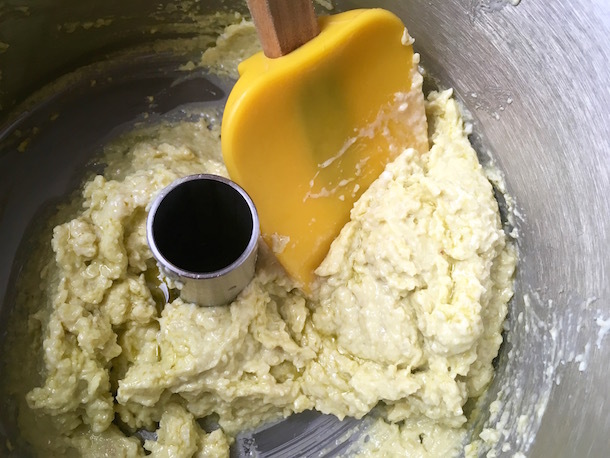 The skordalia recipe by Daniel Gritzer relayed how important it was to reduce the amount of starchiness in the potatoes by rinsing before and after cooking then letting them dry out before mashing—this helps reduce the starch and to help prevent them from turning into glue. This recipe is a mildly adapted version of Daniel’s recipe and it worked pretty well. Potatoes are so tricky. They can produce a mucky mess when over-mixed and too much starch is released as the cells are ruptured. You can rice (with a ricer or food mill) or mash these—I like to use the mashers with holes that produces more of a ricing action instead of a mashing one. 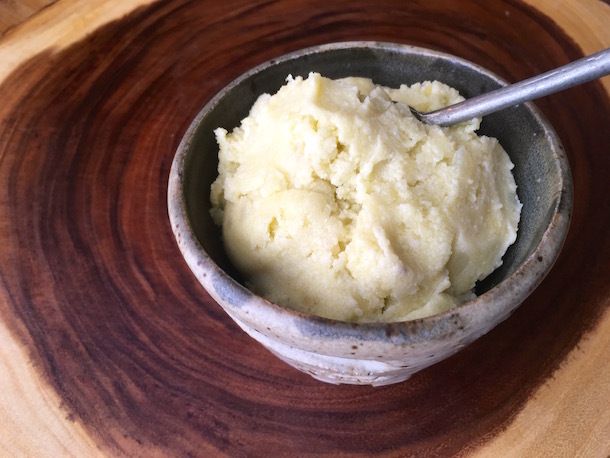 Blend the blanched nuts, garlic and olive oil into a paste in a food processor or blender, then add to the mashed potatoes in a bowl. 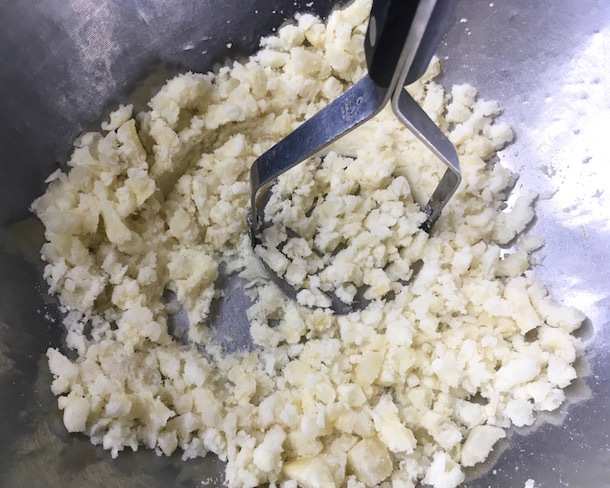 For the most part you never want to put cooked potatoes into a food processor, see that previous part about sticky mucky mess. Cooking Light has a great list of Common Cooking Mistakes and their antidotes, there’s quite a bit of handy kitchen wisdom within this post that could help explain various cooking glitches. Skordalia is traditionally served as a side with fish or used as a dip with pita. All would be good. 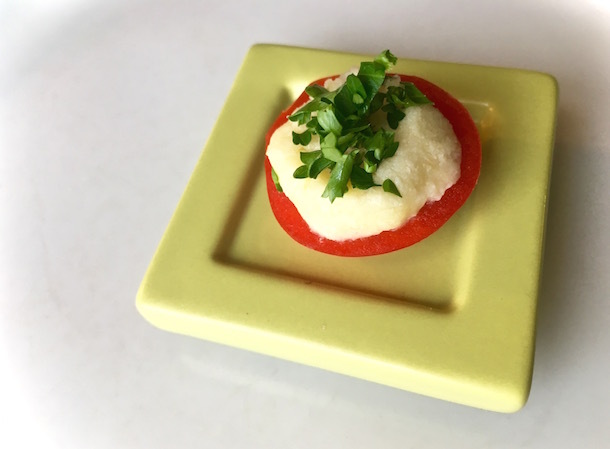 I liked how it held together so tried it on small pieces of red pepper—a great color contrast with the parsley! Boil 10-15 minutes, until potatoes flake apart with a fork. Drain in a colander and rinse again with cold water. Spread potatoes on a cookie sheet and set in the oven until dry, 6-10 minutes. Blend for 1-2 more minutes. Rice or mash the potatoes, then stir in the Almond mix. Taste and adjust—you may need Salt depending on the saltiness of the cooked potatoes. If you prefer the texture to be softer for a dip, stir in more cold water a little at a time. Serve warm or chilled and garnish with parsley or other chopped herbs. 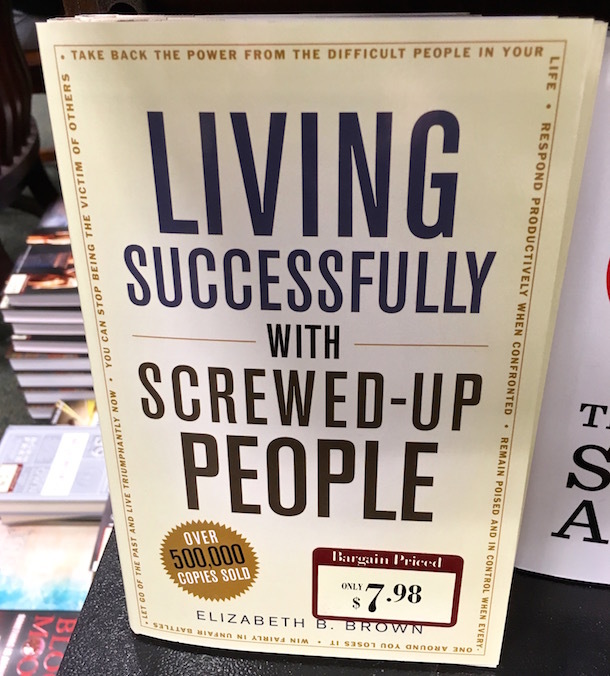 Don’t worry, this is for no one in particular, I just came upon it over the weekend while shopping for my 2019 planner and it made me laugh…could be handy for this season of holiday gatherings.